Chelsea reduced Manchester United's lead at the Premiership summit to three points with an easy win that left West Ham staring relegation in the face. Shaun Wright-Phillips' solo effort put Chelsea ahead after 30 minutes, but a rare Petr Cech slip allowed Carlos Tevez to level five minutes later. 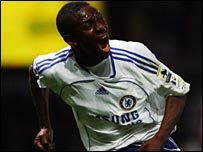 Wright-Phillips volleyed in to restore Chelsea's lead within seconds. Salomon Kalou bundled in the third after 53 minutes and Didier Drogba raced clear to wrap up the victory. It means United's lead is still only three points as Jose Mourinho's side simply refuse to give up on their dogged pursuit of a third successive title. Chelsea boss Mourinho made five changes from the side that reached the FA Cup final by beating Blackburn - but once again they demonstrated their enormous reserves of character. The opening 30 minutes were evenly contested, and it took a moment of individual brilliance from Wright-Phillips to break the deadlock. He had the strength to hold off Yossi Benayoun and the guile to deceive Jonathan Spector before driving a perfect finish across Robert Green. But West Ham responded with vigour and equalised inside five minutes - courtesy of a rare lapse by Cech. Tevez's angled shot from 20 yards carried power, but was at a comfortable height for Cech, only for the normally immaculate keeper to allow the ball through his grasp. West Ham's delight lasted only a matter of seconds before another stunning finish from Wright-Phillips restored Chelsea's lead. Bridge was the creator with a cross from the left, but it was met with an instinctive right-foot strike at the near post from Wright-Phillips that flashed high past Green. West Ham had a chance to draw level in the opening moments of the second half, but once Bobby Zamora tamely turned George McCartney's cross into Cech's arms, the destiny of the points was decided. Chelsea made it three after 52 minutes, when Frank Lampard's free-kick found Drogba, and even though Green blocked his effort on the line, Kalou was on hand to turn in. Drogba shot inches wide before he made it four after 62 minutes, shaking off Lucas Neill's attentions to beat Green with ease. "We will keep going. This could go right to the end, but for it to do that we need to do what we did recently and put three wins together. "In the first half we were excellent and I think the fans appreciated that. We had our chances, equalised and the could have equalised again, but you have to take your chances against Chelsea because they are a top side. "It was a blow to concede so soon after equalising. It has happened to us before. "It is not because of this game that we are where we are. We have lost big games against the teams around us. "We don't need a miracle. We need to win football matches." "The feeling is really indescribable but I have got to put it out to the lads, they have believed in me since the start and that makes it easier. "It is only normal the more games you play the better you get and it is starting to come through as I wanted. "We knew what we had to do. We are behind United and we have to win every game to put them under pressure. "It was another bridge to cross and the determination is unbelievable." West Ham: Green, Spector, Collins, Neill, McCartney, Benayoun, Reo-Coker (Mullins 76), Noble, Boa Morte, Tevez (Blanco 83), Zamora (Cole 72). Subs Not Used: Carroll, Davenport. Booked: Reo-Coker, Neill, Mullins, McCartney, Boa Morte. Chelsea: Cech, Diarra (Ferreira 46), Carvalho, Terry, Bridge, Essien, Mikel, Lampard (Ballack 78), Wright-Phillips, Drogba (Joe Cole 67), Kalou. Goals: Wright-Phillips 31, 36, Kalou 52, Drogba 62.